What is Cataracts disease and what can I do to prevent it? A cataract is a clouding of the eye's natural lens, which lies behind the iris and the pupil. The lens works much like a camera lens, focusing light onto the retina at the back of the eye. The lens also adjusts the eye's focus, letting us see things clearly both up close and far away. 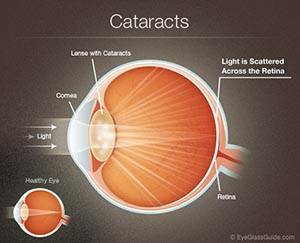 Most cataracts occur gradually as we age and don't become bothersome until after age 55. However, cataracts can also be present at birth (congenital cataracts) or occur at any age as the result of an injury to the eye (traumatic cataracts). Cataracts can also be caused by diseases such as diabetes or can occur as the result of long-term use of certain medications, such as steroids. No one knows for sure why the eye's lens changes as we age, forming cataracts. Researchers are gradually identifying factors that may cause cataracts and gathering information that may help to prevent them. When symptoms of cataracts begin to appear, you may be able to improve your vision for a while using new glasses, stronger bifocals and more light when reading. But when these remedies fail to provide enough benefit, it's time for cataract surgery. 2. Aren't presbyopia-correcting IOLs a lot more expensive? How much extra do I have to pay? 3. Why won't Medicare or health insurance cover the full cost of presbyopia-correcting IOLs? At a 2007 American Society of Cataract and Refractive Surgery conference, some reports indicated that even experienced cataract surgeons needed to perform enhancements for 13% to 15% of cases involving use of presbyopia-correcting IOLs. Enhancements don't mean that the procedure itself was a failure, because you likely will see just fine with eyeglasses even if your outcome is less than optimal. But it's possible you may need an additional surgical procedure (such as LASIK) to perfect your uncorrected vision after cataract surgery with a presbyopia-correcting IOL. Depending on the arrangement you make with your eye surgeon, you also may need to pay extra for any needed enhancements. Source: AllAboutVision.com. Article © 2015 Access Media Group LLC. All rights reserved. Reproduction other than for one-time personal use is strictly prohibited.